Glitter & Grunge Studio: Family Reunion... Bittersweet. My "Snapshot Saturday" photo is very special to me. I didn't take the photograph. In fact, it was years before I was born. 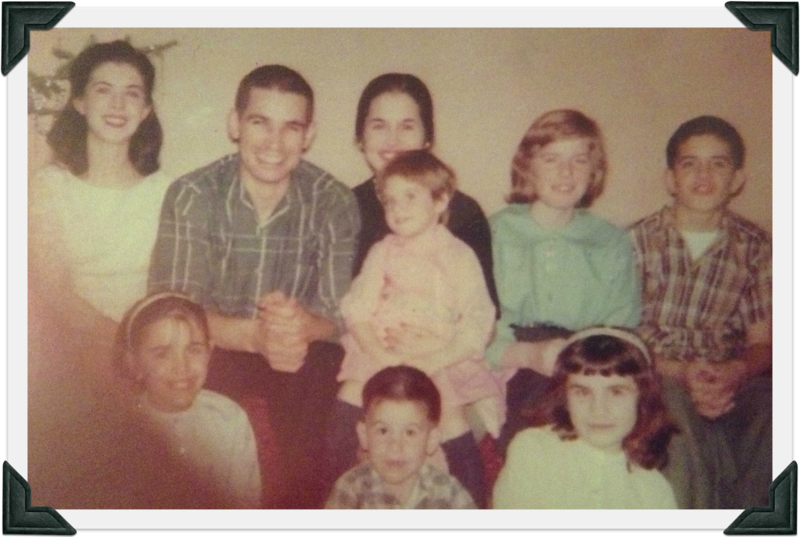 This is the only photo I know of that has all nine of my mom's siblings together. I treasure this photo, with the finger blur and all. My guess is that is the finger of someone else we all loved... grandma, grandpa, or another relative. From the back row, left, it's my Aunt Kathleen, Uncle Jack, Carol (my mom), Aunt Peggy (Margaret) on mom's lap, Aunt Frannie (Frances), and Uncle Mike (Michael). The front row, left is Aunt Rita, Uncle Vinnie (Vincent), and Aunt Ali (Alice). When I look at this photo, my heart wants to burst with love and sorrow. Not only do I love all of these people because of the place they hold in my life, but I feel that my mom passed on her love for them for me to hold in my heart. I never knew anyone who loved their siblings as much as my mom loved hers. All my life I heard the stories. She so looked up to her older brother and sister. And she so mothered her younger siblings. Two of my aunts and one of my uncles lived with our family at alternating times. Aunt Rita is my godmother. When my grandmother died, Aunt Peggy was only 16, and Uncle Vinnie was only 18. Kathleen and Jack lived a long distance away, so my mom became the mother figure for her youngest siblings. Aunt Peggy, only ten years older than me, was more like a big sister than an aunt. My grandfather passed on three years before I was born. He was only 45 years old. My grandmother passed on when I was 7. She was 59. My mom never got over their loss, especially of her mother. On the day she told me that the doctor told her she only had three months to live, she actually seemed at peace and anticipating the joy of being with her mom, dad, and brother Jack (who died at the age of 42). When my mom passed on in 2005, we were all heartbroken. No one could have imagined that one year later, we would be facing the devastating, tragic death of her youngest brother, Vinnie, due to a brain aneurism. Within a few more years, her oldest sister, Kathleen, passed on, and just months ago, the day after her 58th birthday, her youngest sister, Peggy, had a sudden, severe heart attack, and died. A week after my aunt died, my Aunt Rita's son, Brian, lost his battle with brain cancer, at the age of 35. Our family was so grief stricken by his loss. As we gathered for his funeral, we all resolved to get together this summer to share more joyful moments. Today was that day. We gathered to celebrate family, and to remember those who are no longer with us. Aunt Peggy's husband brought her remains home to Rhode Island, and we held a small memorial. My cousin, Amy, and her husband, hosted the reunion, and we all enjoyed food galore, a bonfire, a bouncy house for the kids, and remembering the good times until late in the evening. The goodbyes took hours, as no one really wanted to leave. We never imagined at the last reunion that Brian wouldn't be there for the next one. No one wanted to say good bye. My cousin set up a beautiful table with photographs of all of our relatives who have passed on; Our great grandmother, our grandma and grandpa, Uncle Jack, my mom, Uncle Vinnie, Aunt Peggy, our cousin Tammy, our cousin Troy, and our cousin Brian. Only one of those relatives lived beyond her 60s. My mom had only lived to 60. If there's a moment when you realize that life hands out no guarantees, and you better live life to the fullest, it's looking at those photos on that table. Too many lives gone too soon. I feel so blessed to be a part of this family. The memories I hold dear in my heart have faded a bit over the years. Sometimes those memories feel so magical... so precious... so perfect, that they seem more like stories read from a treasured, tattered book, than real moments. But, they were real. The two weeks spent up in the Berkshires each summer with Uncle Jack's family, the winter wonderland adventure, driving to Aunt Kathleen's wedding in Philadelphia, the early reunions at Wallum Lake, the 4th of July outings at Aunt Ali's pool, the Thanksgivings and Christmases hosted by my mom... Each memory is more wonderful than the last. As all of our individual families have grown, we've spent less and less time together as an entire extended family. And though some memories have faded, the love has not. It is good to get together and remember. Each of these aunts and uncles have affected my life in one way or another. I love and appreciate them more than they could imagine. Many of my cousins are counted among my dearest friends. There are moments when my heart breaks because it seems the traditions that once bound us all together are now all but forgotten. There are no more big weddings, no more holiday gatherings, and few reunions. But each aunt and uncle have become the matriarchs and patriarchs of their own growing extended family. I can hardly believe that I am now a grandmother! So these events when we are able to gather, though they may be few and far between are so very precious. And I am glad that my children are able to connect and rekindle relationships with their second and third cousins, building memories to treasure in their own hearts someday. I hope and pray they do. And I hope this one photograph, as well as a similar one my husband has of his mom and her siblings, makes it's way into each of our children's photo albums. This was a great family that endured all of the joys and sorrows, good times and heartaches of their generation. As in all families, it was the best and worst of times. More than once, the short end of the stick was the one they came up with. But they never gave up. They never gave in. I was touched by the fact that three family members present at the reunion were divorced from among the siblings pictured here, one was widowed from one of them, over thirty years ago, and one was widowed recently. That about sums up this group of people. It's not about perfection. It's not about perfect endings. If you were a part of our family, you always will be. I am very thankful for that kind of love. You are blessed, indeed, to have such a love-filled family who treasure their time together! Thanks for sharing this lovely tribute.